It was late November and I was once again in a field in the south of France. This time the sun was setting and the field was filled with revelling Frenchmen. Freshly harvested chestnuts were being roasted over a decidedly unsafe fire pit while we all drank homemade fig wine. 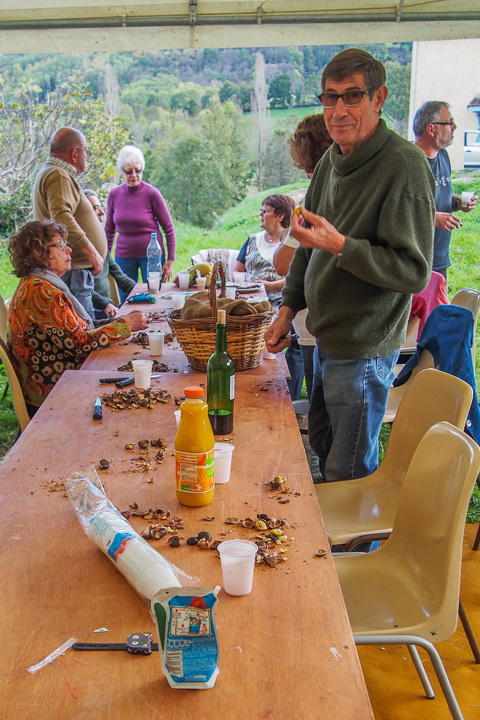 I had been invited to attend a community chestnut roast in France and I was savouring every moment. A few hours earlier, I had been gathering the very same chestnuts we were about to eat. I was living with a French family on a beautiful farm outside of Foix in southwestern France. They were kind enough to invite me to go foraging with them in a nearby public forest and I jumped on the chance. It was a cold, wet day, but I knew I couldn’t miss the opportunity to visit a state-owned park where local residents sustainably harvest organic forest products. At this time of year, it was chestnuts but in another season it could have been mushrooms, berries or wild herbs. Myself, my host, her two year old and their two dogs piled into a little red car and drove through the beautiful countryside. As we made our way along the muddy trail, the dogs were running everywhere with unrestrained jubilee. The two year old’s enthusiasm was infectious as she ran, climbed, played and then eventually fell right into a stream! The forest greenery was luminescent in the soft, filtered light of the overcast day. The gentle rain covered everything in a pale shimmer and made for a rather magical setting. We gathered the well-camouflaged chestnuts from the ground and off the lower branches of the trees. My gloves made me awkward and I got more than one sting from the highly protected, spiky nuts. Once we had filled three baskets, we headed back to the warmth of the car and the promise of the chestnut roast that evening. Back at the roast, we prepared the nuts in what was a labour-intensive process. First the spiky exterior cracked off, then the nut roasted with soft inner shell intact. Later the burning hot nut must have it’s soft shell removed and the paper thin layer peeled away. All this before the smooth, creamy nut inside can be eaten. Roasted chestnuts are anything but a quick snack. Embedded in the act of eating a chestnut is an appreciation for the regional environment, for family and friends, for community, for tradition. It can be difficult to have an authentic experience when travelling and it is rare to develop a lasting connection with a local person. I was fortunate to have the opportunity to participate in a local custom in a French village where tradition is still alive and well. Have you ever been part of a wonderful community celebration while travelling? I’d love to hear all about it in the comments below! Now It’s Your Turn: Is there an event in your community that celebrates an annual harvest or particular food? Attending a community gathering is a great way to meet your neighbours, learn about regional agriculture and enjoy a delicious seasonal treat. Maybe you could attend a Strawberry Social or a Corn Roast or a Maple Syrup festival! Mmm! This sounds like so much fun and exactly the sort of activity that I’d love to do with my family. I love the idea of taking part in local traditions when I’m travelling. You’ve inspired me to pick more of the chestnuts up in the woods when I’m walking the dog at home! 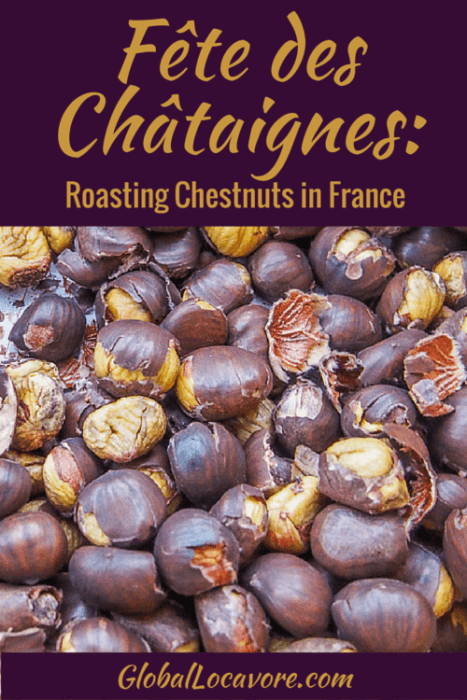 I’ve never tried chestnuts but it seems like a lovely tradition and I’d love to experience in it France once! I am surprised since I didn’t know how many layers to have to go through to get to the actual nut. That is a new one for me. Fortunately, we have a lot of harvest celebrations in California. There are strawberry, avocado, garlic, artichoke and many other festivals. Those are the perfect opportunities to try some of the best produce and meet farmers. What a lovely community festival and experience! A beautiful post, Lauren!